It’s been quite a while since I’ve written about a book I read this year, it’s time to catch up! 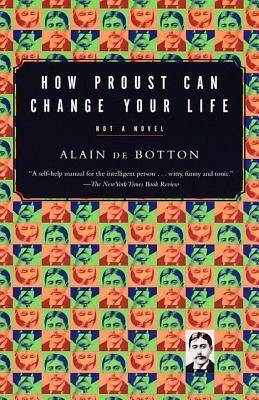 First in my queue is How Proust Can Change Your Life by Alain De Botton. Earlier this year I was really on a Botton-kick and bought this book right after reading On Love since I enjoyed that one so much. I’ll start by saying that that I had not, and still haven’t, read anything by Marcel Proust. In fact, after reading this HPCCYL I probably never will. Not because his work seems bad (in fact, it seems rather fascinating) but rather because I think that I will glean more from his work reading about it rather than reading it. De Botton painted Proust’s work as very verbose, meandering and hard to follow. This was, at times, the point. I’ll be honest, it’s been many months since I read this book. Nonetheless, as I’m going through it again my notes are reminding me of some of the beautiful and intriguing parts of it. Though my thoughts on the book may be lacking, I’m hoping they will coalesce as I write this post. Wow, that was a long sentence. But also, pretty amazing if you stop to think about it! When I encounter a newspaper I usually meet it’s stare with extreme apathy. I simply don’t have the emotional capacity to deal with everything that’s happening in the world. It amazes me that someone can spend a huge portion of their day simply empathizing with people that he doesn’t even know! I can’t believe I’ve had the audacity to be bored in my life! You don’t get to say I’m bored. A great exercise would be to try and live like Proust would for a day, in this way. Unleash your curiosity on everything, let your imagination run wild. One of the reasons I enjoyed learning about Proust so much was not because of his prose but because of his adroit observations. Observations regarding situations that I’ve been in but haven’t had the wherewithal to view the situation as he has. For instance, “When two people part it is the one who is not in love who makes the tender speeches“. Though not always true, I think that this line speaks to many fundamental human truths. When one person is no longer in love, they need to convince themselves that they are, in fact, a good person. I can see the eloquent speech that they make telling their former lover how they’re amazing but it’s just not going to work etc. etc. I really enjoy how much one sentence can evoke such strong emotions. While pondering this, though, it reminds me of a School of Life video about how to end a relationship. TL;DR if you actually care about the other person let them hate you (yes, I’m aware that I’m only citing things related to De Botton right now I’ll find other stuffs to talk about, gawd). Whoa. Here is an amazing friend who would give everything he has to his friends just to make them a bit happier who thinks that friendship is, at its heart, useless. To Proust, the fact that friendship is a sham (this could be said about many things, but let’s use friendship as an example for now) doesn’t make it any less meaningful. Though, he still valued friendship and through his actions developed many devoted friends as well. It’s like contemplating death: at a certain time in your life you’ll realize that death is inevitable and you can mentally meander toward the worlds of nihilism or humanism (this isn’t a direct opposition but bare with me). Wherever you go, those who are enlightened will realize that death is fated and will go on to live wonderfully fulfilled lives as if it weren’t. I like to think that they will do so in spite of that fact. In the mind of Proust, beauty abounds. “…beautify is something to be found, rather than passively encountered, that it requires us to pick up on certain details, to identify the whiteness of a cotton dress, the reflection of the sea on the hull of a yacht, or the contrast between the color of a jockeys coat and his face.” Everything is beautiful, if you pay attention. An interesting mantra for the time. It reminds me of demisexuality which is “a sexual orientation in which someone feels sexual attraction only to people with whom they have an emotional bond.” The book doesn’t go into much detail if this is an orientation that Proust might have aligned himself with, but he does seem to possess some inclinations toward it. The mediocre usually imagine that to let ourselves be guided by the books we admire robs our faculty of judgement of part of its independence. “What can it matter to you what Ruskin feels: feel for yourself.” Such a view rests on a psychological error which will be discounted by all those who have accepted a spiritual discipline and feel thereby that their power of understanding and of feeling is infinitely enhanced, and their critical sense never paralysed… There is no better way of coming to be aware of what one feels oneself than by trying to recreate in oneself what a master has felt. In this profound effort it is our thought itself that we bring out into the light, together wish his. To make [reading] into a discipline is to give too large a role to what is only an incitement. Reading is on the threshold of the spiritual life; it can introduce u to it: it does not constitute it. And with that rare semi-colon actual-colon sentence, I’ll depart from the book in consideration of my conclusion. To be fair, I didn’t do this post justice. It’s been so many months since I’ve read this book that I had to rely heavily on my notes and less on what I recall of the piece. After skimming it through again though, I’ve found that it contains many interesting pieces of information. One thing I do recall, is that this is how the entire book seemed to me: interesting tidbits in relation to Proust’s life that don’t have too much standing in my own life but are simply, well, fun to think about. Nonetheless, I really enjoyed skimming through this book again and think this blog post will suffice in terms of what I would like to take away from HPCCYL. With that, bon nuit Marcel.